In association with Lochboisdale Hotel and support from Caledonian MacBrayne, join us to celebrate the MV Lord of the Isles arrival, marking the historic start of the new Lochboisdale / Mallaig route, and show our continued support for the trial. 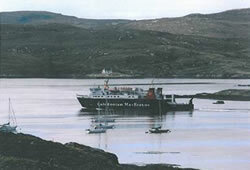 Saturday the 16th at 12:30pm in the Lochboisdale Hotel car park, see the ferry arrive to a welcome from local speakers. Hot soup & BBQ, Cakes, Treats & Bouncy castle. Music by Uist Pipe Band & Benbecula College students. Musical entertainment in the Locboisdale Hotel in the evening. Promotional offers in local shops: Local venison, pre-Christmas discounts and tea / cakes.